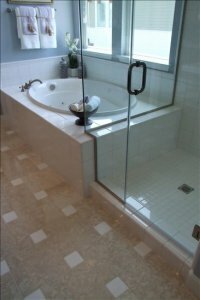 Bathrooms are one of the most important factors in determining the worth of your home. One of the most popular remodels that homeowners are doing today is creating larger, more luxurious baths with a host of features from steam showers to whirlpool baths. So what are you to do if your bathroom is not large enough to accommodate his-and-hers showers and recliner chairs? Learn some tips for small bathrooms that will make any sized room feel positively decadent. Light colors make a room feel more open and inviting. In small bathrooms, it’s especially important to use a light, airy color scheme for the walls, floor, and ceiling. For visual interest, use bright accents, such as towels and wall decorations, to perk up the room and let your style shine through. Nothing makes a room feel as claustrophobic as dark shadows. Make your small bathroom feel open and inviting by ensuring that there is plenty of light. You can be creative with your light sources, installing recessed lighting in the ceilings, installing sky lights or enlarging existing windows, and using wall sconces and decorative lighting for a more interesting look. Windows are an effective way to make any room seem much larger. Mirrors also reflect light, adding to the bright and airy feeling of your small bathroom. Aside from the sink mirror, you can also hang mirrors on the walls as decorations to expand the perceived size of your room. Clutter can make even the largest of rooms look too small; in an undersized bathroom, clutter is the enemy. Keep the number of items that you display in the open to an absolute minimum. Use one beautiful, larger accent piece or wall hanging instead of a number of smaller pieces. Vanities, medicine cabinets, and shelves can eat up the space in any bathroom. To maximize the room in your small bathroom, replace vanities with pedestal sinks and look for more creative ways to store towels, toiletries, and other necessary items. By following these tips, you can make even the smallest of bathrooms feel roomy and welcoming. How to make small rooms look larger.